As our world grows increasingly smaller it’s easier than ever to seek refuge in the comfort of familiar places. Yet, we live in a time when thoughts and ideas manifest in flashes of delight, th blink of an eye and round-the-world travel is at the fingertips of risk takers and adventurers alike. I see Marco Polo and Gertrude Bell in the men and women I met abroad. Sharing the road, sharing tales of individual split-second experiences worth more than time itself. I started blogging back in 2012, shortly after moving to Jordan — not only to share my story and to learn from others, but to inspire, to instill the momentum it takes to lace up ones boots and hit the road. It wasn’t until I found myself alone in a most foreign country that I felt the hot passion of life. Where my native tongue was about as useful as the moo! of a cow and most the time, I had no idea what the hell I was putting in my mouth… but it tasted good and I wanted more! And that is why you must hit the road. Let’s take control of 2015. Don’t be afraid to leap without looking. I encourage you to take off the training wheels and take the road less traveled. 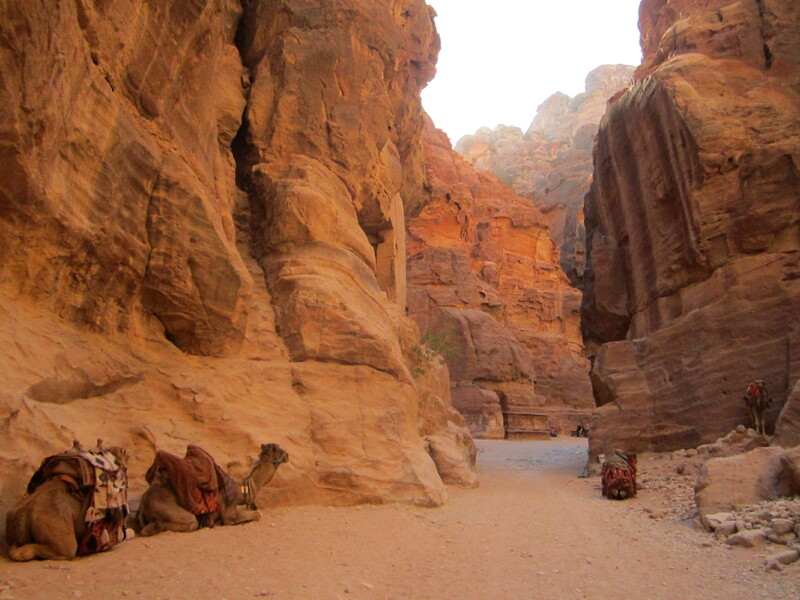 The winding sandstone canyons that hide the fabled city of Petra. Here, where Bedouin live in caverns, past and future can be seen in the present. This is a land legendary and proud. Where pastoralists and sedentary pedestrians mix. The desert is hot madness, yet soft and poetic. It’s exotic as it is wild and it fuels my thirst for adventure. whoa, this place looks insane! So very well put! Great words for such a noble message. This truly is an inspiration and I couln’t agree more. Well said, indeed! A Happy New Year, may it be a rich and colourful one! Godspeed. I’m glad you favored a tweet of mine because now I found you here! I’m on WP too lol. Beautiful photography! Written by a very young Frenchman who set out on a journey of discovery much like yourself back in 1789. Well worth the time and effort. Excellent piece! (Wish I wrote it.) Thanks for sharing and enjoy the road. Amazing photo. I like your writing too. You liked my post on West Australian writers, so I thought I”d see what you were up to, and hit on an Aladdin’s Cave of treasures. Have you finished your book yet? I’m digging your blog, Man! Gah, sorry it’s taken a terribly long time to reply. I get so caught up in the world offline and become neglegent. So I do apologize. Not yet! I’m pushing to have a tight rough draft completed by the end of summer. Then to seek out an agent/contemplate publishing method… It’s a long road. Thanks for asking. Before long i’ll be posting random excerpts on the blog- wee teasers to get the word out and see what the public reception feels like. Inspiring comments! I’d love to quit my day job and get on the road! I love this message and hope that I can inspire people the way you are. Getting out of your comfort and into the world is the greatest thing a person can do, as far as I’m concerned. In fact, when my son finished high school, I gave him the little bit of money I’d saved for his college and told him that if he’d rather go travel with it, he could. And that’s what he did. What a fantastic post to start off 2014! I definitely share your sentiment to not be ruled by the culture of fear but instead to live life to the fullest. Your blog is fantastic and really inspiring. Well done you for booking a one way to ticket to Casablanca – a modern day renaissance man! By the way thanks for stopping by and liking my blog! Thank you for following my blog because now I have found you! This is fantastic! You are certainly a kindred spirit and I feel like so many sentences in this post should be placed on plaque’s, written in books, and shouted from the rooftops -.”Don’t be victimized by the culture of fear.Our planet is waiting to be explored, to reveal it’s secrets to you, to me, to any who dare ask, it will expose you to the raw truths of life” – Nicholas Andriani, 2014. 😉 And that’s just one! I shall be a loyal follower. Thank you and keep up the great work! Thank you for stopping by my blog! I couldn’t agree more about not letting fear be an obstacle! AMEN to this “Don’t be victimized by the culture of fear” words to live by – and remind me to keep going towards my goal of permanent (and early retirement) wanderer. Right on. Mission accomplished. That’s one journey I certainly want to follow. My best experiences were in slow travel. Crossing borders on foot with a rough draft itinerary and an X on the map, open for the world. Bulgaria is going to be a wild ride. I’m not too familiar with the modern republic, yet I know it’s had an incredible presence through history and that’s sure to reflect in the current. I’m going to have to rummage through your Zazzle shop, I could use a new Iphone case! One of my favourite quotes of all times is “Leap and the net will appear” ~John Burroughs. It says much of what you are saying here. Don’t be afraid. Everything will turn out fine. Just go. As a traveler, you know that sitting at home and making contingency plans is not as useful or as wise as it seems. Sure, make some plans. Good idea. Just know that something (several somethings, more like) is going to come up that you had no way to plan for, and THAT will actually be the critical turning point of your adventure. It will also turn out to be the best part of the story, when you re-tell it for others. Thank you so much for this message, because I am always ready to be reminded. The potential for being scared out of action is constantly present, and having a spirit like yours is the only way to address it: take off the training wheels, don’t be cautious, don’t be afraid. So where are you off to now? Oh, so what was your final impression of Athens? You must! It’s a very spiritual site. Pre-Islamic, Roman, Arab influences thriving and falling and thriving for 2,000+ years! Incredible! Thank you so much for reblogging this post. Great shot. Ironically I sensed that was Petra instantly, as it is such an archaeological favorite of mine as it is for so many others—even though I’ve never been. Shlama!